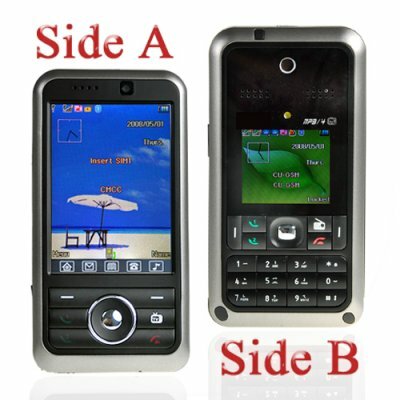 Successfully Added Touchscreen Cell Phone with Dual SIM + Dual Screen to your Shopping Cart. Touchscreen cellphone with dual SIM + dual standby, two screens, three GSM bands, and rich media features as its signature features. This touch screen mobile phone represents true convergence technology. On one side of the device is a simple and fast phone with full keypad and on the other all the phone functions are paired with a touch screen and full multimedia PDA powerhouse - TV, FM Radio, software tools, and media playback on a larger QVGA screen. The media side also gives access to the phone so you'll never miss a call even when watching a movie or listening to music. The included TF card slot ensures you've always got plenty of expandability and Bluetooth functionality will grant you wireless music streaming and data transfer. Sure to be a hot seller, this mobilephone has it all! Order stock today from your favorite no M.O.Q. (no minimum order quantity) drop-shipping wholesaler - Chinavasion. Dual screen and dual camera mobile phone with rich multimedia and software features. Two SIM card slots with dual standby. Advanced Bluetooth features including A2DP + AVRCP. Media friendly cellphone with built in TV and FM Tuners and support for many popular audio and video playback formats. The screen switch button at the left side of the phone allows instant-on switching between displays. NOTE: This product is compatible with GSM at the frequencies of 900MHz, 1800MHz and 1900MHz. Please check with your local provider if you are unsure of your local band requirement.